They look like rocks, you’d think they’re rocks, but they are plants that grow together to make reefs. And they are the oldest evidence of life on earth. What are they?Stromatolites. They are believed to be about 3.5 billion years old and the earth is thought to be about 4 billions years old. Now that’s old! And they’re here in Exuma Cays Land and Sea Park. Most reefs are composed of coral that are made up of tiny animals called polyps. These animals look like an upside-down jellyfish. However, stromatolites are mounds of tiny hair-like bacteria called blue-green algae or cyanobacteria (sigh ANO bac teer e ah). 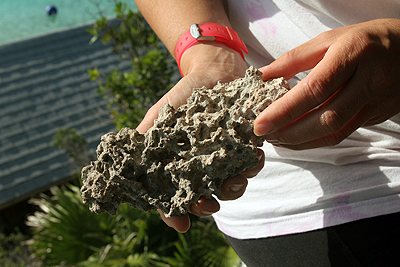 They trap and cement sand together into tightly packed layers of limestone. These mounds are called Stromatolite reefs from a Greek work meaning mattress-rocks. They grow and accumulate as layers of cemented sand piled one on top of another. Layer by layer, they grow very s-l-o-w-l-y. For years, Scientists thought Stromatolites went the way of the Dinosaurs. They became extinct. Then, living stromatolites were found in Australia where the seawater is too salty for other animals and plants to survive. Recently, in the 1980’s, they were discovered in the Bahamas. 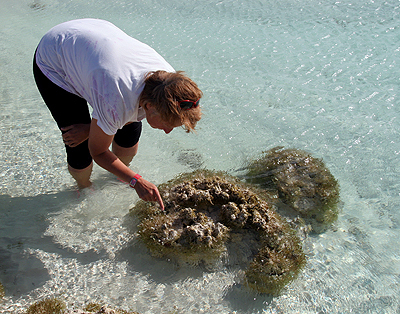 The hair-like bacteria that create stromatolites need light to grow. So they position themselves towards the sunlight to grow. As the plants grow, they trap more sediment and bind particles together. Over time, the deeper layers become cemented into limestone and form a strong base while the top remains living and delicate. As they grow, they create columns or mounds. If they grow out of the water, they soon stop growing because they dry out. However, they grow sideways and eventually mounds grow into each other. Then, through long periods of time, stromatolites turn into rocks. For much of the earth’s history stromatolites were the building blocks of reefs, creating large masses of calcium carbonate. Today, Scientists have discovered only a few locations where these building blocks exist. Luckily, we’ve been able to see them here at the Park. Tom and Judy were enjoying life aboard their sailboat in the Berry Islands, Bahamas when a friend asked for Tom’s help. The Park Ranger at Exuma Cays Land and Sea Park needed to leave the park for a month. So, Tom and a friend both agreed they would come down and help out 2 weeks each. Tom’s buddy left but Tom and Judy stayed. That was 4 years ago. Tom and Judy both work in the park, are passionate about the park. They are a welcoming voice to all new visitors.